Brazilian cowboys. Who knew? Turns out DJ BBQ did and he brought back this recipe from the gauchos to you. 2 Score the fat on the meat and rub generously with the mustard powder. Seal in a bag and marinate in the fridge overnight. 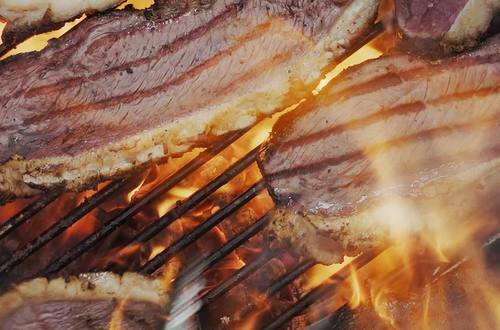 3 Place the steak onto the BBQ just away from the coals to slowly render down the fat. Turn after 10 minutes and place over the higher heat. 4 Brown off the rest of the beef and rest on a chopping board for 5 minutes. 5 Slice the beef into thick steaks and season with salt and pepper. 6 Grill the steaks on the high heat again until medium rare. Rest for 5 minutes and serve with the dipping sauce.